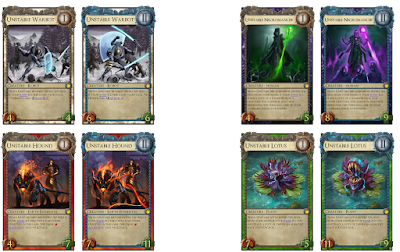 Welcome to the first instalment of Wishful Thinking, where we look at several cards I came up with, according to a theme. 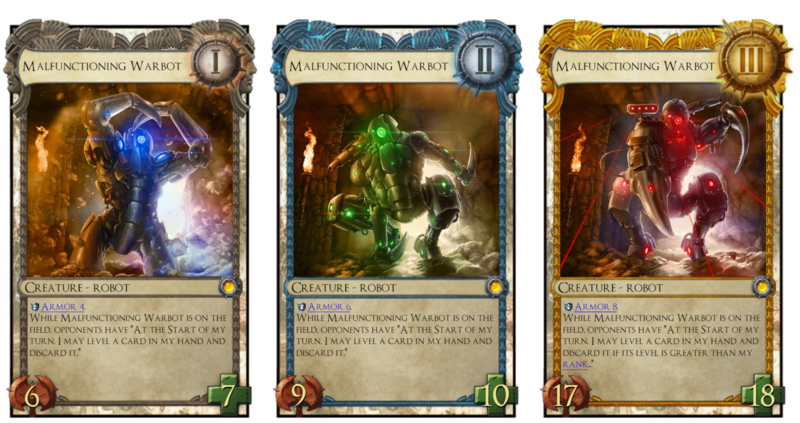 Obviously, these aren't real cards (hence the series' name), but it's always fun to imagine, no? 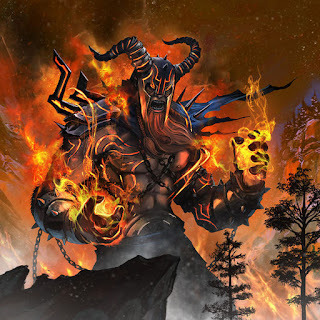 Aggro as an archetype has always been in a weird place in Solforge, many really big level ones have been introduced across the course of the game's history. We went from Deepbranch Prowler and Shardplate Mutant to Scatterspore Eidolon, and now Shardplate Behemoth, the latter of which went on to just be a good card, instead of a slot in aggressive decks, but we never did get a really good aggro deck, Goodstuff decks like AT Explosives and the old BQ Tracker decks, sure, but not a deck that had a really powerful early and mid game, but tapered off in PL3 and beyond. Part of the reason for the above is that the big level one creatures simply cannot measure up to mediocre level twos, the latter often trading for 2 big level ones. That means even as an aggressive deck winning four lanes, if your opponent can stabilise on 2.1 with two level twos, you often just lose a majority of your lead in an instant. 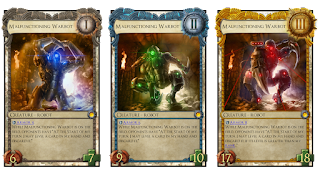 That is a problem I doubt card design can solve completely, since its an inherent quality of Solforge cards that most of levelled cards are stronger than their unlevelled counterparts. Enough rambling, on to the cards! We already have had big cards, but what if we made them BIGGER? That's right, it's even bigger than Behemoth, and doesn't even shrink! But the dastardly catch is that you get permanently poisoned once it dies. You heard that right, you yourself get put on a clock. But that shouldn't matter if you win by the end of PL2, no? 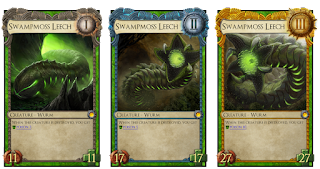 I want to stress that Poison stacking up will start to sting, almost assuredly cementing Leech's slot in only aggro decks. Another thing to note is that replacement, whether from effects like Dendrify or overwriting the old-fashioned way, will not proc its death trigger. A cycle that takes the twist of the Bound cycle and reverses it, instead of offering powerful underdrops, give you very powerful on-level creatures, but demands you play them on curve or otherwise are only mediocre vanillas. I was slightly tempted to put Consistent on the level twos after Link suggested it, but enough power to them eh? 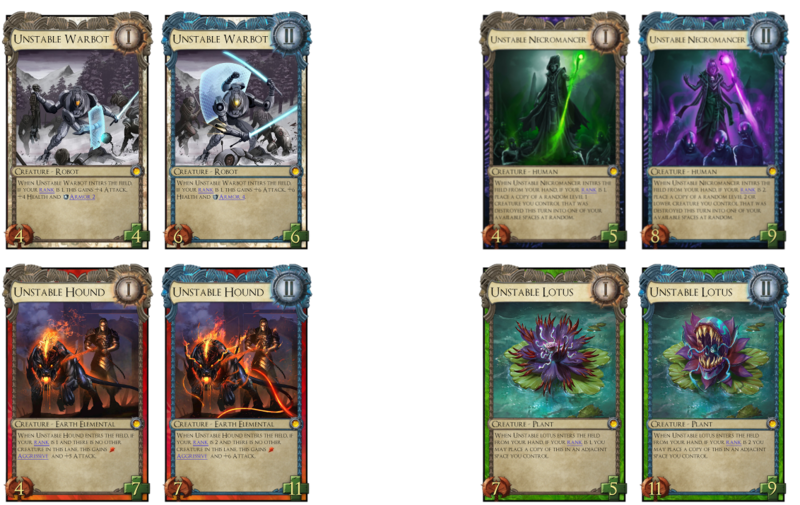 I doubt you toss these into any constructed deck, but rather slots into our aggro goal quite nicely, they are inherently a risky venture, of course, you could whiff and not draw a single one of them in player level one (~2.9%). But I believe this is the best I'm getting to making actual aggro cards. On a side note, I always liked the idea of giving your opponent stuff as drawback, and these two cards definitely fit that plus our theme. Big aggressive creatures are always potent, and you might consider it mediocre at a glance, but take into account Relic Scout, Oratek Explosives and Rage of Kadras, and maybe you'll see why I made its body scale so poorly. 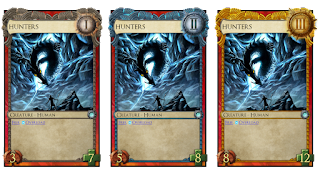 Hunters are pretty bland, free dudes, and besides being pumped by Weirdwood Patriarch and their odd interaction with Ironmind Acolyte, they aren't quite noteworthy. They are also terrible at fighting big guys, (Never said they were good hunters!) 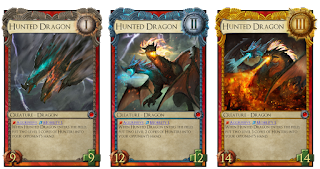 and the Dragon will happily gobble them up, unless of course you kill the Dragon with something big and get two 3/7s off the back of it, which might help your opponent fight against your board slightly better. A really durable and extremely overstated body that can be chump blocked but gives your opponent level advantage, meaning if your opponent chump blocks or neuters it, he'll keep getting free levels on his card, which can spell disaster if your opponent wants to be levelling otherwise dead cards like Energy Surge and Dendrify. 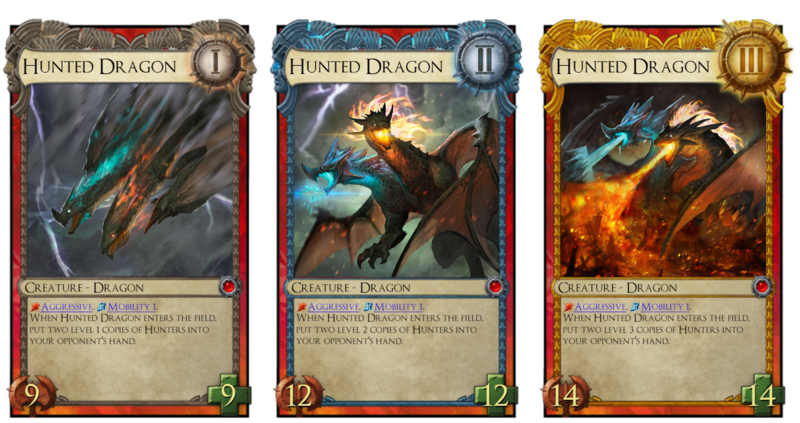 It scales pretty nicely, but the level three's text can easily lose you a game, but maybe at that point your opponent will have all his cards levelled anyway. And that about wraps up this pilot article! Of course, the numbers on the cards are just rough estimates (as if we'll ever get to play with these), but the basic idea is there. Finally, discuss! Card ideas are always a great medium for discussion, and I would love to hear what you all think about the cards I proposed and Aggro in general. 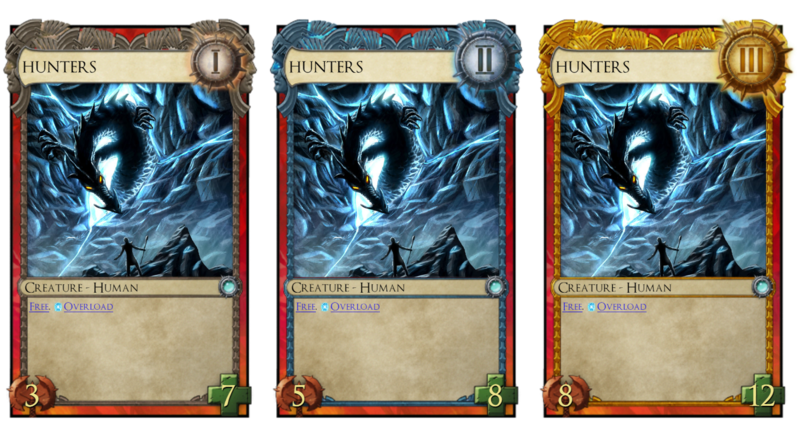 I really like the design of these cards (though the balance may be a bit off). I am especially impressed with the way the "reverse bound" (dnuob?) cycle allows a deck to invest in its early game without just giving it a great underdrop (which is a problem I see with your other suggestions/submissions). I do like how you varied your approach to giving up late-game advantage for early game. 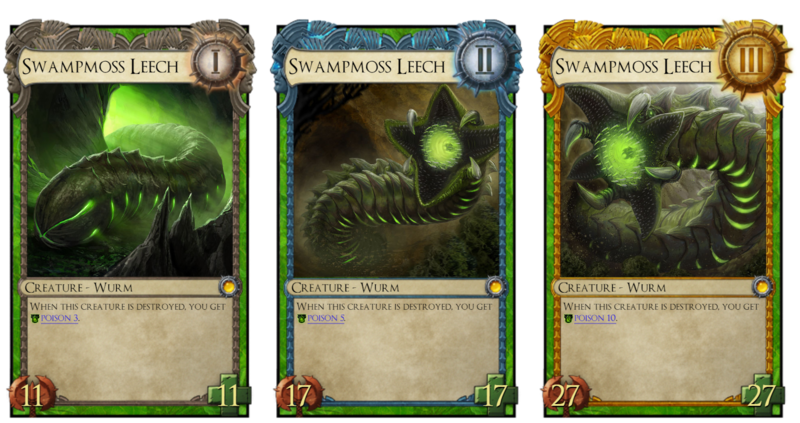 I find it curious to imagine that your unstable cycle of creatures have Consistent at Rank 1 only.